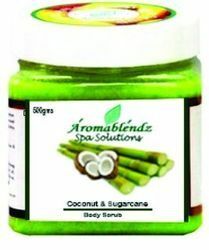 Our product range includes a wide range of aromablendz apricot peach body scrub, aromablendz black current moisturizing body scrub, aromablendz walnut body moisturizing scrub, aromablendz apricot lemon grass body scrub, aromablendz orange and green tea body scrub and aromablendz tea tree body scrub. 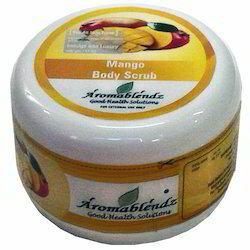 Use & Benefits: Aromablendz Apricot Peach Body Scrub is a 100% natural, oil based exfoliator. It has a triple function. Sea salt crystals exfoliate dead skin cells, easing the top skin layer renewal. Vegetable oils and Shea Butter nourish and moisturize the skin. Tea Tree essential oil, being the most powerful natural antibacterial ingredient, cleans the skin deep in the pores.This product is safe for every kind of skin, and even for people with very sensitive skin. 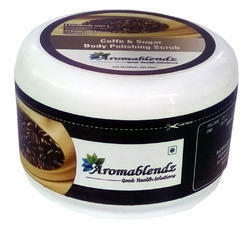 Application: Body scrubs are better to use on the clean, damp skin. Mix well salt with oils before use. Put scrub onto your palms and then distribute it onto your body using massage motions until salt will melt. Rinse well with water. Use towel if necessary. Otherwise let the skin absorb water with oils for better moisturizing effect. Ingredients: Sea salt, Butyrospermum parkii (Shea Butter), Oryza sativa (Rice) Bran Oil, Helianthus Annuus (Sunflower) Seed Oil, Carthamus Tinctorius (Safflower) Seed Oil, Sesamum Indicum (Sesame) Seed Oil, Melaleuca Alternifolia (Tea Tree) Oil, Melaleuca Alternifolia (Tea Tree) Leaf, Limonene, Vitamin E.
Recommendation: Avoid use on any cuts or delicate areas. Do not exfoliate if skin is sunburned or irritated for any reason. 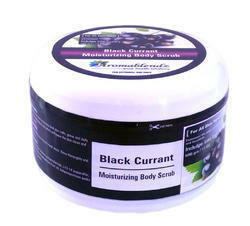 Use & Benefits: Aromablendz Black current Body Scrub is a 100% natural, oil based exfoliator. It has a triple function. Sea salt crystals exfoliate dead skin cells, easing the top skin layer renewal. Vegetable oils and Shea Butter nourish and moisturize the skin. Tea Tree essential oil, being the most powerful natural antibacterial ingredient, cleans the skin deep in the pores.This product is safe for every kind of skin, and even for people with very sensitive skin. 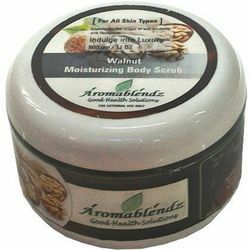 Use & Benefits: Aromablendz Walnut Body Scrub is a 100% natural, oil based exfoliator. It has a triple function. Sea salt crystals exfoliate dead skin cells, easing the top skin layer renewal. Vegetable oils and Shea Butter nourish and moisturize the skin. Tea Tree essential oil, being the most powerful natural antibacterial ingredient, cleans the skin deep in the pores.This product is safe for every kind of skin, and even for people with very sensitive skin. 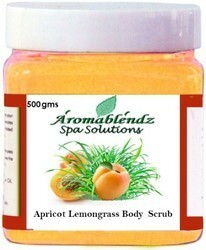 Use & Benefits: Aromablendz Apricot Lemon Grass Body Scrub is a 100% natural, oil based exfoliator. It has a triple function. Sea salt crystals exfoliate dead skin cells, easing the top skin layer renewal. Vegetable oils and Shea Butter nourish and moisturize the skin. Tea Tree essential oil, being the most powerful natural antibacterial ingredient, cleans the skin deep in the pores.This product is safe for every kind of skin, and even for people with very sensitive skin. 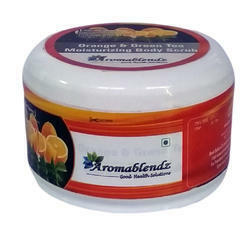 Use & Benefits: Orange body scrub instantly makes your skin soft, smooth, healthy, glowing and vibrant. This mild yet Invigorating Body Scrub smoothes away bumps and flakes for incredibly soft skin. Fruit Oils deeply moisturize while anti-aging vitamins and antioxidants nourish. Fruit Acids brighten gently for a healthy glow. Application: Use small amount and massage gently onto wet skin. Rinse thoroughly with warm water. Ingredients: Oat Bran, Corn Meal, Sweet Almond Oil, Sunflower Oil, Olive Oil, Jojoba Oil, Calendula Extract, Tea Extracts, Chamomile Extract, Marshmallow Root, Orange and Ginger Essential Oils, Vitamin E, Walnut Shell Granules & Natural Preservatives. Recommendation: Do not use on broken or irritated skin. 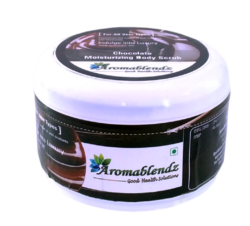 Use & Benefits: Aromablendz Tea Tree Body Scrub is a 100% natural, oil based exfoliator. It has a triple function. Sea salt crystals exfoliate dead skin cells, easing the top skin layer renewal. Vegetable oils and Shea Butter nourish and moisturize the skin. Tea Tree essential oil, being the most powerful natural antibacterial ingredient, cleans the skin deep in the pores.This product is safe for every kind of skin, and even for people with very sensitive skin. Use & Benefits: It scrubs away the skin impurities, dead cells, blackheads and white heads, leaving skin feeling fresh, healthy and radiant. Walnut shell particles smoothen the skin texture by removing dead skin cells and help regenerate new cells. Application: Wet your face, apply scrub and massage with upward circular movements for about 2 minutes. Rinse and pat dry. Avoid areas around the eyes. Ingredients: Vitamin C, Walnut Scrub granules, Sunflower Oil, Gum Acacia, Surfectants & Excipients. Uses & Benefits: This hydrating formaultion buffs your skin to perfection with sugar cane extracts and infuse potent vigin coconut oil to give deep hydration. Known for its ancient healing properties, coconut contains high levels of antioxidants and hydrators to restore your skin, leaving it soft and supple.Recommended for all skin types. Application: Apply a layer of the sugar scrub to damp skin with a circular scrubbing motion. If desired, use a body brush to increase effects and to increase stimulation. Rinse off completely. Ingredients: Sugar & Coconut Shell Granules, Virgin Coconut Oil, Sunflower Oil, Comfrey Root Extract, Green Tea Leaf, Rosemary Extract, Calendula Extract, SugarcaneBark Extracts, Biocomplex Vitamins A-C-E, & Natural Preservatives. Recommendation: Do not use on broken or irritated skin. Use & Benefits: Commence the treatment by gently massaging using soft, circular motions. Massage & scrub till the surfectant & scrub granules thoroughly exfoliates the skin & stimulates blood flow. It leaves the skin looking smoother and younger. It has an anti ageing effect. Application: Apply evenly on wet skin and gently massage in a circular motion, focusing on rough areas. Leave for 10 minutes, rinse thoroughly and pat dry. Ingredients: Coco Powder, Citric Acid, Magnesium Sulfate, Lithothamnium Calcareum, Avena Sativa Flour, Magnesium Oxide, Laminaria Digitata, Parfume & Excipients. Cautions: Avoid use on any cuts or delicate areas. Do not exfoliate if skin is sunburned or irritated for any reason. Application:It can either be used at the beginning or towards the end of the treatment, gently massaging intothe skin using soft, circular motions. Once the skin has been sufficiently scrubbed, the product can then be washed off.Deep Sea Salt thoroughly exfoliates the skin & stimulates blood flow leaving the skin looking smoother and younger. Tocopheryl acetate (vitamin e) as main ingredients along with excipients. Caution: People with sensitive skin should avoid hard scrubbing as it might lead to a break out in rash & redness. 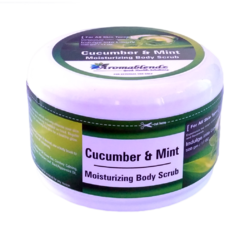 Uses & Benefits Cool Cucumber Exfoliating Body Scrub has an ideal mix of ingredients which actively cleanse your skin to remove dirt, oil, and other impurities that buildup on skin the skin making it look dull an tired. Regular usage deep cleanses the pores unclogging debris, revitalizing & softening the skin for a healthy glow. Application: Apply a layer of the sugar scrub to damp skin with a circular scrubbing motion. If desired, use a body brush to increase effects and to increase stimulation. Rinse off completely. Ingredients: Cucumber Puree, Raw Sugar Cane Granules, Sweet Almond Oil: , Sunflower Oil: Green Tea, Comfrey: Calming, Antiseptic , Mint: Restorative, Stimulates Epidermis , Parsley, Marjoram Leaf, Basil,Peppermint Oil, Vitamin E.
Application: Scoop out a handful of this skin softening scrub & massage gently over the skin. 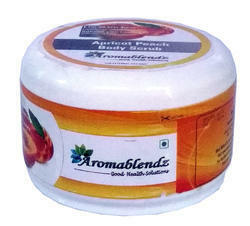 Use & Benefits: Aromablendz Orange and green Tea Body Scrub is a 100% natural, oil based exfoliator. It has a triple function. Sea salt crystals exfoliate dead skin cells, easing the top skin layer renewal. Vegetable oils and Shea Butter nourish and moisturize the skin. Tea Tree essential oil, being the most powerful natural antibacterial ingredient, cleans the skin deep in the pores.This product is safe for every kind of skin, and even for people with very sensitive skin. 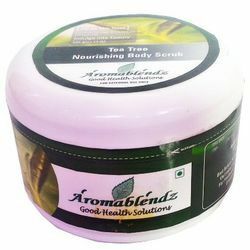 Looking for Aromablendz Body Scrubs ?